A light salad on a hot summer day is so refreshing. This salad was inspired by the insalata Caprese – a combination of fresh mozzarella, tomato and basil seasoned with olive oil, salt and pepper. 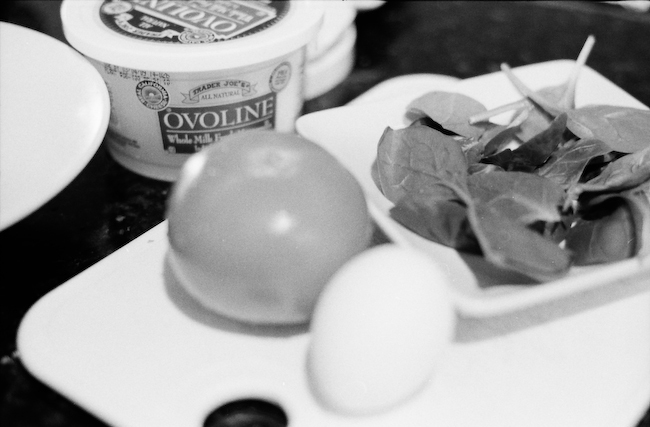 Instead, we switched the basil for baby spinach, big slices of fresh mozz for bocconcini and added in some sliced hard-cooked egg. The refreshment of this salad reaches beyond appetite, and into health benefits. Less is more with this Italian classic that emphasizes the popularity and allure of the famous Mediterranean diet. It provides dairy (although in small quantities), vegetables, and unsaturated fatty acids, all of which are tenets of this heart healthy eating pattern. Simple, fresh, yet filling ingredients go a long way in terms of satisfaction. We’re much less likely to overeat if we’ve satisfied both our physical hunger as well as our senses, and this salad does both. What’s your favorite summer salad? Please share ideas with readers in the comments section! How Stacey Got the Shot: Used Ilford HP5 black and white film. The ISO is 400 and in low light in the kitchen, I probably used a very wide aperture (the shallow depth of field is evidence of this) and shutter speed slower than 1/60 second.